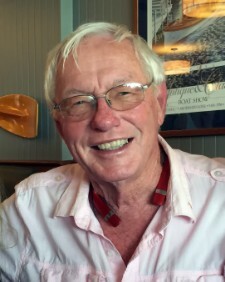 John P. Kimball II, aged 78, died peacefully in the presence of his family twenty five days after being diagnosed with cancer, on October 27, 2018, in Cumberland, Maine. Born in Rochester, New Hampshire, to Mary LeVangie and John P. Kimball, John P. Kimball II grew up in Wolfeboro, NH on Smith River racing boats and raising hell. John was known for his strong work ethic and his belief in the power of positive thinking. He was a friend to all and often made a statement by his appearance alone. He spent half his career in radio and half in the car business~these were the driving forces of his professional life. John had a strong sense of civic responsibility. He served his country in the Air Force, and over the course of his life belonged to several service organizations including Laconia Rotary, Lakes Region Exchange Club, Bektash Shriners, and others. He enjoyed anything that meant going too fast: skiing, sailing, driving fine automobiles, riding motorcycles, flying Cessnas, and anything involving water. John is survived by his four children Margo LK Harrington (Don), Amy Kimball (Ed), J. Todd Kimball (Jen), Chris Kimball (Holly), and grandchildren Sarah, Katherine, Nathaniel and Diana, as well as nieces, nephews, and cousins. There will be a public memorial service at All Saints Episcopal Church in Wolfeboro, NH at 2:00 pm on Friday, November 9, 2018. Burial will be private. In lieu of flowers John asked that contributions be made to Laconia Rotary Club.